Every now and again something weird drops into my email and I just shrug and think that sounds interesting, lets do it. Vanishingly rarely I’m offered something to review, or an event to go to, or something to write about. Much more often, it’s poorly written and sometimes downright discourteous PR posts from people hoping to use my blog’s tiny amount of SEO clout and I just ignore them. But sometimes it’s an offer of something tangible. And so last week I was invited to a soirée to sample a new menu at the Living Room in Hockley, Nottingham. This is a place I have been to twice before. Once to film day after reaction pieces and menu unveilings for Come Dine With Me, and a second time last year for our PGCE Christmas meal. The first time I boggled that they had a bottle of cognac for £2500 on their menu, and the second – well, as an impecunious student I wasn’t hugely impressed at the value for money of their Christmas party offering. This time I plus one was invited to a Blind Tasting of some new menu items, which sounded rather interesting, never having done anything like that before. It was on a school night, but it was early and promised only to last an hour, so I thought I could just about cope with balancing the work and the opportunity to go and do something a little different. We arrived a little late as my Plus One got held up in traffic and I dashed straight from work to home to the event in my school tie and suit. Arriving, we went into the bar and found in progress a cocktail making class with a large group of people huddled round the bar learning how to make an amaretto sour from a barman keen to show off his flair. Unsure whether that was part of the event we hung around behind them watching until my companion wisely suggested we check upstairs in their main dining room to see if they were there. Indeed they were, and they were champing at the bit to start, we by then being ten minutes late to something they’d urged us to be punctual for. We were hurried to seats, time to barely exchange names with the people next to us, and then put on our blindfolds. The evening was fascinating. We were given tasters of lots of different food across the menu. 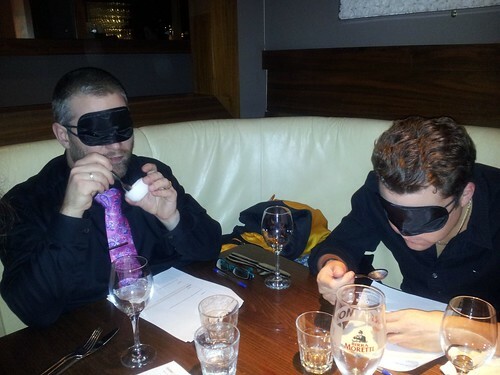 Blindfolds on, food served, empty spoons / pots / glasses whipped away and then we could take off the blindfolds and answer in writing a quick quiz with very specific questions: what is the sauce with the duck? What meat is in the shepherd’s pie? Name three ingredients in our Glamorgan sausages. The technicality of eating what you can’t see was fab, and half the times our hands had to be guided by our unseen waiting staff right onto our food. 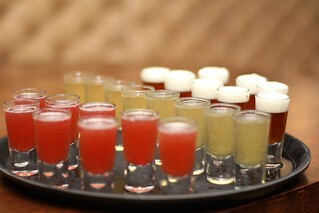 “Hold your hand in a cupping motion!” and then they placed a shot glass with a cocktail taster right into your fingers. And with no sight of what you’re eating, it is really disconcerting. There were a number of times when I was chewing a mouthful with no thought really other than this is pretty tasty but I have no idea what it is. I did find myself pondering colours. What colour is this mystery food? Because the plates were removed before we could take off the blindfolds we didn’t even know that! When the quizzes were marked and we got to know the answers, one thing that really did surprise me was that I had been unable to identify or even notice that at least two of the things I had eaten had things I think I really don’t like in them. “What are the ingredients in this tart?” was one question. I had identified the huge sloppy splash of something that came out of the tart and landed on my tie when I bit into it as honey, but had been oblivious to the fact that the main ingredient was butternut squash, which I thought I hated. The fish course was served with broccoli; I had no idea and thought it was cabbage! Somehow I managed to end up with more points than my fellow guests – although many of the points I got not from being able to taste ingredients, but having prior knowledge of what is in things. 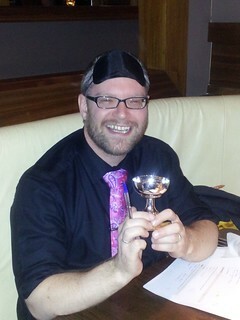 I have made Glamorgan sausages, so I know what is typically in them; I know you make a daiquiri with rum; I know what to expect on a cheeseboard so if I’m stumped for ideas I will write brie, cheddar, stilton… and somehow this clocked up to a winning score, which netted me a dinky little trophy and the adulation of my fellow diners. After it was all over we invited downstairs for a free drink and then there was an opportunity to actually talk to our fellow diners, who turned out to be representing Experience Nottinghamshire, Noshingham and Nottingham Confidential. Quite how I ended up in such illustrious company is anyone’s guess. Talk turned to our experience of the Nottingham restaurant scene and we had quite a few minutes on whether Hart’s is better than World Service. (they thought yes, I think no. Both have amazing lunch time offers as well as the expensive à la carte evening offer) It’s a shame talk didn’t turn more comprehensively to the mid-range Nottingham restaurant scene rather than the high-end, as I think that’s a much more diverse market. 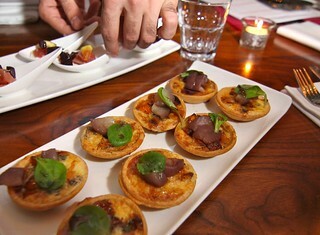 All in all, it was a very agreeable evening and the taster foods we had from Living Room were definitely delicious. Highlights for me in particular were the duck in plum sauce, the Glamorgan sausages and their delicious new pudding the Basil Grand, a sort of Eton mess with Grand Marnier and, yes, basil. Basil. In a pudding. Sounds crazy but was delicious. I have a good friend who believes that teacher training mainly consists of getting the trainees in a room and showing them a video of a student tipping on a chair, falling off and dying. Once the trainees have seen this, they can truthfully go on and tell their students they saw someone fall off and die once, as part of the daily patter of the things we tell kids not to do. I have been reading through this forum on TES this evening (why? should be either planning or sleeping!) and it seems tales of woe resulting from chair tipping are never far away, whether or not you need a snuff video in your training year to underline the point. Tales of falling and cutting heads, falling onto sharpened pencils, falling and biting through lips, and tripping others up are commonplace. Many traumatised teachers recount tales of the injuries they have had to deal with and the damaged children and staff that have resulted. The bits I like best were the strategies when telling a child to sit properly has not worked. Sit on the chair properly – or stand – or sit on the floor. Sit on the chair properly, because I don’t want to spend my afternoon mopping up your blood when you fall and break your head. Sit on your chair properly because I can’t have a new carpet for another 10 years and I don’t want this one stained. Sit on the chair properly because the last thing I need is to have to fill in another “child injured” form. Sit on your chair properly because if you fall out and fall unconscious, who do you think in this room is going to have to give you the kiss of life? And rather liked it. As she explains it came from a period when poetry was beginning to be a written rather than oral medium, and so poets could experiment with how things looked on the page. 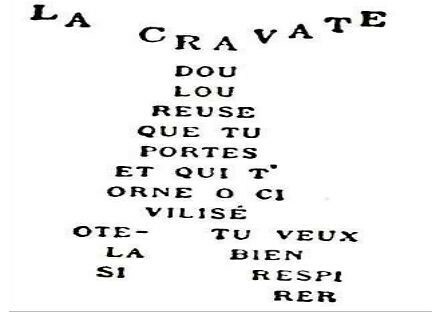 Follow the link above for some super examples of students’ work writing poems in French related to war. Anyway, apart from being a nice piece of work, I approve of the sentiment in the words. That painful tie you wear, decorous and civilised: take it off if you want to breathe.